ey, hey guys! I am pretty excited because in today’s review I am going to show you a veeery interesting gadget. Wait, that’s not all, it’s also a quite practical device and is pretty affordable too. I can feel I have your attention now, so I will not make you wait more, this is Android mini PC. As you can see the device’s dimensions and shape resemble are pretty compact. If we didn’t know what it was we would bet on an mp3 player, or a 3g flash drive probably. But no, it’s a pocket-size pc. I can feel you are already curious to know more so here it is. Actually this is one independent Android-based computer. All you need to do in order to use it is a monitor or a TV with an HDMI port and a USB mouse and there you go, you have a computer. For faster typing you can also attach and use a keyboard, although Android mini PC has a virtual on-screen keyboard. You connect via USB and there is also one micro USB port. Surf the Internet from the comfort of your couch. After you connect the device you press the start button and it quickly loads the working interface. 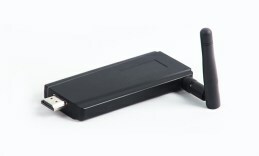 As you can see the device has an antenna which allows it to easily connect to your router via WiFi so that you can easily browse and load videos online. The Flash player v 11.1 was a pleasant surprise to us, most video pages load instantly but there are some delays when loading heavy websites. However, YouTube videos run perfectly even in FullHD resolution. Follow your favorite internet shows on your on your widescreen. We even attached the device to a multimedia projector with an HDMI port, inteserting and flexible solution for work and school presentations. The hardware on board features a single core Cortex A9 at 1GHz working frequency facilitated by 1GB of DDR3 RAM. The built-in storage is 4GB but it can easily expanded with 32GB more thanks to the provided microSD card slot.